The City of Cincinnati recently rolled out a major update to its city services app. “Fix It Cincy” replaces “City Hall,” published two years ago, and includes changes like a streamlined user interface, easier-to-use categories and map-based GPS location. The new app is a part of a larger city effort to stay up-to-date with constantly changing technology and continually improve the efficiency of city services and processes. Those kinds of changes in providing services aren’t new. Citizen reports of graffiti or broken street lights that used to come through traditional mail or telephone eventually migrated to the city website. Apps are only the most recent addition, providing a platform for those and many other service requests right from your smartphone. Fix It Cincy is available for free on the App Store and Google Play. Users of the old City Hall app will have to download the new one and delete the previous version. 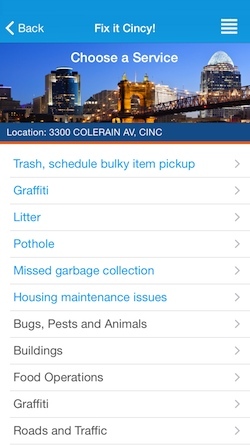 Fix It Cincy opens on a screen with three options: You can request a service, view service dates in a specific area (like trash and recycling collection) or check on the status of requests you’ve already made. When you make a request or view dates, you’re directed to a map of Cincinnati to find your location by GPS, selecting a location on the map or searching by address. (This stage takes a while to load without a high-speed wifi connection.) The map also shows the location of pending service requests others have submitted. Once a location is selected, users can request a wide variety of city services or report problems — from housing maintenance and food operations issues to missed garbage collection, litter, potholes or broken traffic lights. A new feature re-design is that you can submit a photograph of the issue in addition to a written description. The visual communication will help the city know exactly how to fix the problem. As Merz explains, the city uses a different method to treat a 2-inch pothole than a 12-inch pothole, so a picture of the pothole uploaded through the app makes it much easier for the city to fix properly. “The more information we can get on the front end, the more efficient we can be,” he says. Efficiency is one of the main goals of the new app, and that applies to all sides of it. “We also seized this as an opportunity to make the back of the house easier to use as well,” Merz says. Fix It Cincy includes updates that make it easier for city departments getting requests through the app to communicate with each other. That allows to city to respond quicker and creates a similar experience for users no matter what department they’re dealing with. The city will soon be adding a survey tool to collect feedback from the public and continue improving the experience even further. It’s part of the city’s larger effort to use data to continually improve its tech services. “Apps are relatively new, and people are trying to figure out the best way to make them work,” Merz says. Like many organizations, the city originally envisioned an app that would do everything its website did. As city workers gained more experience and the world of apps has evolved, that thinking changed — the city is now making apps that are more focused and try to do one thing well instead of trying to do everything at once. So “Fix It Cincy” is for requesting city services, while “Passport Parking” allows you to pay for your parking space via smartphone. Merz says the city is also looking at dedicated apps for other city departments, like Cincinnati Police, and other technological improvements like overhauling the city’s main website. The new app has been available for just a couple weeks, so there isn’t yet much data on use, but the city is already looking at improvements. Until then, he encourages Cincinnatians to download and use the app to improve the city and how its departments provide services. The rationale is that the more people use the app and the more feedback the city can collect, the more its leaders can improve it.